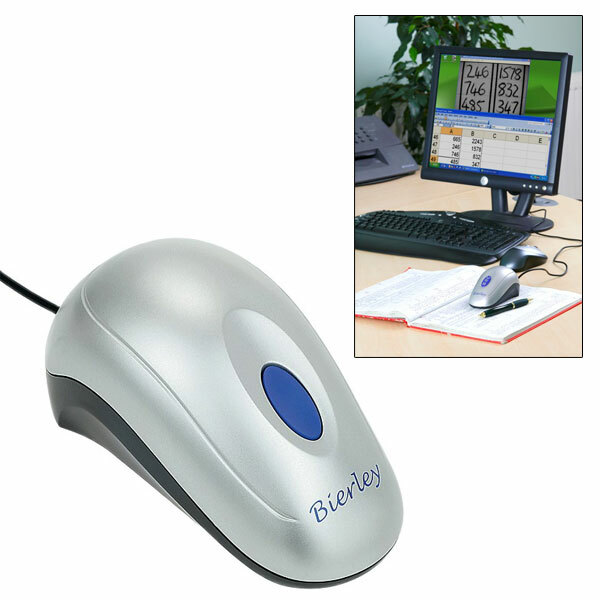 High quality, simple and affordable Electronic Magnifier for people with low vision. The goal is simple: give back independence to people who have difficulty reading small print. With the aid of this ergonomic and easy to use product, people who suffer from vision loss can enjoy reading everything from the daily newspaper to the latest author, and can easily view everyday items -- from food labels to prescription bottles. Its compact size - only slightly larger than a standard computer mouse - makes it comfortable to handle. Works with any desktop or notebook PC using USB2.0 and Windows XP, Vista and Windows 7 or 8. Displays a crisp, clear black and white image. Simply resize the image on your PC to change magnification. Plugs directly into any USB 2.0 port. User-friendly full function utility software and 5 ft. easy store cable included. Order yours today and bring the pleasure of reading into your life. 1. Install the driver from the supplied CD the first time you use a MonoMouse-USB-MD. 2. Thereafter, each time you use the magnifier, simply plug it in to a USB 2.0 port and click the application icon on your desktop. 3. Hold the MonoMouse-USB-MD in your hand, just like a computer mouse, and whatever you move your hand over appears magnified on your screen.